This is a great art view of outdoor decoration. 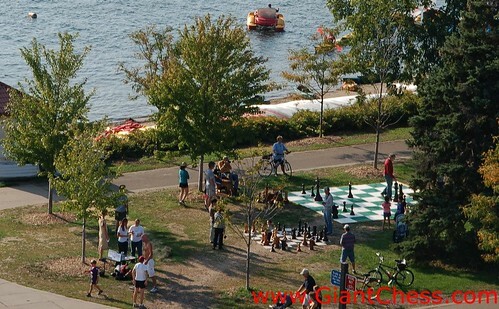 Giant Chess in public garden gives different atmosphere of joy and togetherness. It is a good outdoor decoration that can be enjoyed by many people from all ages. The picture displays the giant chess in neighborhood. They come with two colors, dark and light brown. Adorable! Those giant chess is perfect for the garden or conservatory. Enhance your garden, park, house or hotel with a giant chess set or giant chess piece in teak wood - they are created with the highest ornamental craftsmanship. Wooden chess pieces make an attactive garden feature and allow participants from beginners to expert. If you want to decorate your garden with extraordinary piece of art, the wooden giant chess is highly recommended. It is more than just outdoor decoration, this chess piece is also can be used to outdoor game that will strengthen the bound of your family or friends.